Kara informed me this morning that we need to make treats for her music class for tomorrow morning. She also had no idea how many where in her class. She wanted me to make marshmellow bears, which would be cute, but no so fun to make 30+ of them with almost no notice. I am going to make a much simpler marshmellow treat that would be perfect for a class party. I will be sharing what it is later tonight. 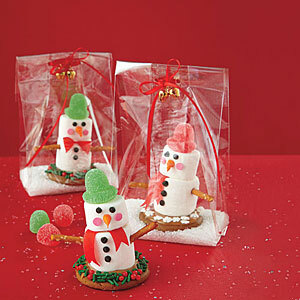 Until then, I found marshmellow snowmen from All You . These would make a cute gifts for a bus driver, neighbor or teacher assisstant and a lot of fun for your child to help put them together.